August 11, 2015 9:30 A.M.
Ontarians want and deserve income security in retirement. However, workplace pension plan coverage is low, the workplace is changing, and experts agree that people aren't able to save enough. Ontario has taken action because retirement savings challenges will worsen without a strong plan for the future. Subject to legislative approval, the Ontario Retirement Pension Plan (ORPP) would provide working Ontarians with a predictable stream of income in retirement. By 2020, every employee in Ontario will be part of either the ORPP or a comparable workplace pension plan. The ORPP is designed to help workers without a workplace pension plan and those who are at risk of not being able to save enough. It will complement existing workplace plans and other voluntary retirement savings arrangements for Ontarians to maintain their standard of living in retirement. The goal of the ORPP is to strengthen Ontario's retirement income system by creating a pension plan with a lifetime benefit and locked-in funds. It is built on the principle of fairness with mandatory matching employer contributions, emulating the Canada Pension Plan (CPP). The implementation of the plan also takes into account the needs of employers. Employers and employees who participate in a comparable pension plan will not be required to participate in the ORPP. Ontario is defining a "comparable plan" as a registered pension plan subject to federal and provincial regulation -- that meets certain minimum thresholds. The government consulted widely on this approach, receiving over 1,000 submissions from business, workers, labour, associations and pension experts. A comparable plan will be defined as certain types of provincially and federally regulated pension plans with contribution levels that ensure similar benefit levels to those provided by the ORPP. In order to be considered comparable, DB plans must equal or exceed the benefits being offered through the ORPP. For this reason, comparable DB plans in Ontario must meet a minimum benefit accrual rate of 0.50 per cent. An accrual rate is the rate at which you build up retirement income in a pension over time. The rate is multiplied by your earnings to calculate how much money you will eventually be entitled to. This rate can be expressed as a fraction -- the bigger the fraction, the greater the amount of retirement income. 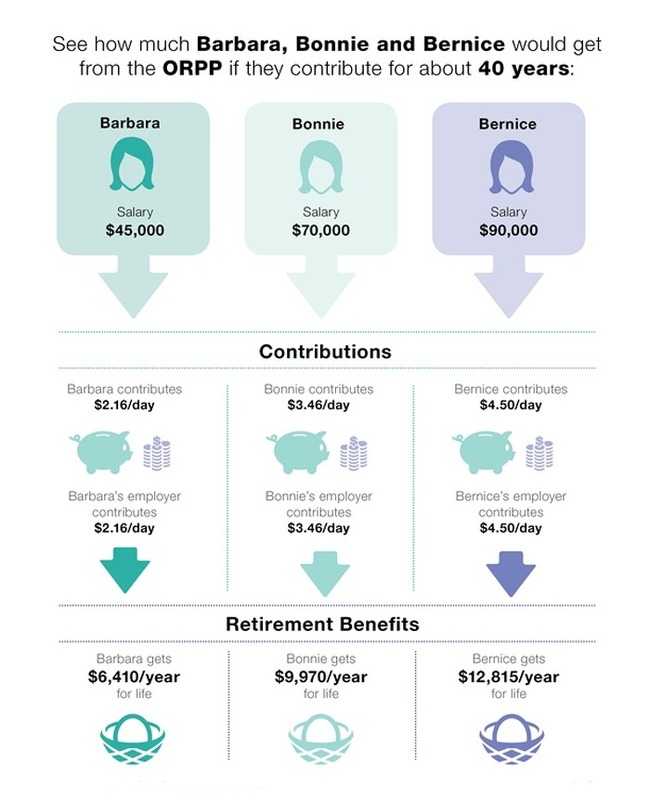 There are considerable differences between DB and DC pension plans. For example, DC plans do not require employer matching. They also do not allow for the pooled longevity and investment risk that provide people the assurance they will not outlive their savings, and protect them from market volatility. Require at least 50 per cent matching of the minimum rate from employers. Ontario recognizes that DB and DC pension plans can be structured in a variety of ways, including DB-DC Hybrid plans, Flat-Benefit DB plans and Flat-Dollar DC plans. As such, Ontario has developed means to convert the ORPP's comparable threshold tests to determine the comparability of these arrangements. Most workers will likely have multiple employers over the course of their careers. As such, ensuring the ORPP is designed with portability in mind is essential. The government is committed to developing a buy-back mechanism for employees in which workers can purchase service credits for periods when they were unable to contribute to the ORPP. Similarly, the government is examining options to allow Ontario employers with comparable plans to opt-in and participate in the ORPP. Further details will be made available once finalized. Our goal is for every employee in Ontario to be part of the ORPP or a comparable workplace pension plan by 2020. That includes the self-employed. Unfortunately, the federal Income Tax Act (ITA) does not currently allow self-employed individuals to participate in registered pension plans. We have asked the federal government to amend the ITA to allow for the self-employed to participate in the ORPP. The province will continue to explore options to enable the participation of the self-employed in the ORPP. We know that business needs time to adjust and certainty in order to begin planning. In order to help with this adjustment, we will be enrolling employers in stages, starting with the largest first and phasing in contribution rates over time. Wave 1: Large employers (500 or more employees) without registered workplace pension plans. Contributions to start January 1, 2017. Wave 2: Medium employers (approximately 50- 499 employees) without registered workplace pension plans. Contributions to start January 1, 2018. 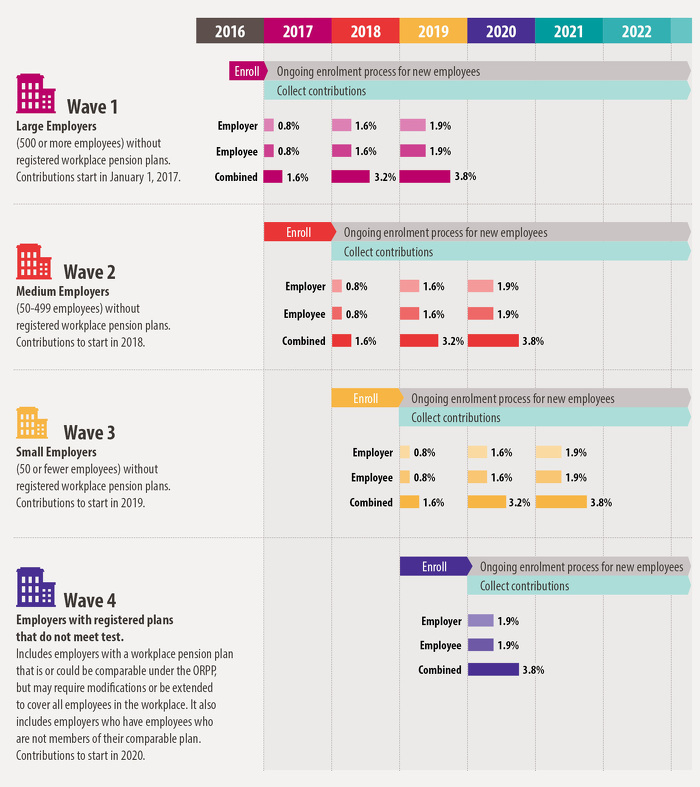 Wave 3: Small employers (50 or fewer employees) without workplace pension plans. Contributions to start January 1, 2019. 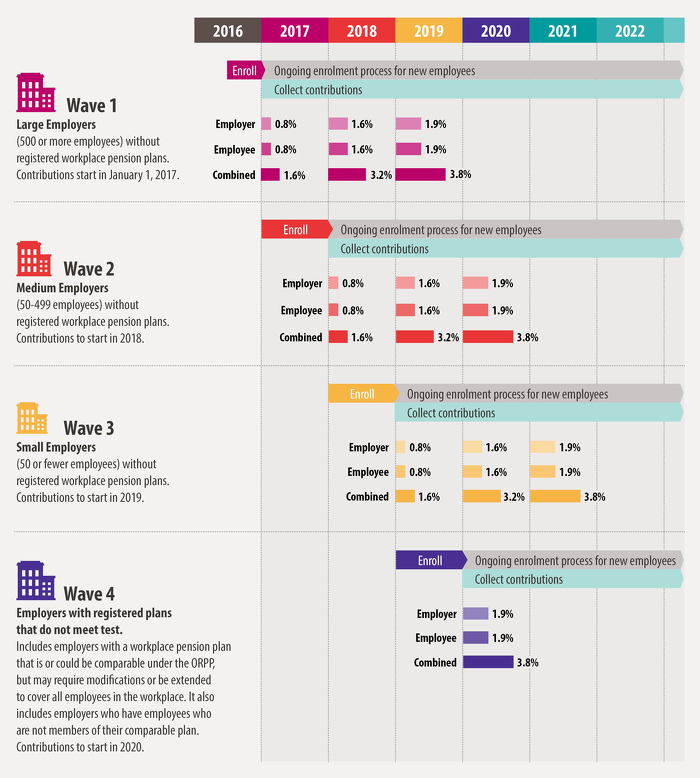 Wave 4: Employers with a workplace pension plan that is not modified or adjusted to meet the comparability test, as well as employees who are not members of their workplace's comparable plan. Contributions to start January 1, 2020. For waves one through three, contribution amounts will be phased-in. Amounts are detailed in the chart below. The Ontario Retirement Pension Plan Administration Corporation (ORPP AC) will begin contacting all Ontario employers in early 2016 to verify their existing pension plans and assess the coverage offered to employees. More information will be forthcoming from the ORPP AC. your salary throughout those years. The ORPP will offer inflation-protected benefits, consistent with the sustainability of the plan, in order to provide a predictable source of retirement income for life. Benefits will start to be paid out to plan members beginning in 2022. The ORPP could, at maturity, pay a dollar benefit similar to the average CPP benefit today. The province is establishing a Nominating Council to provide advice and recommendations to the government on the appointment of the initial board of directors for the Ontario Retirement Pension Plan Administration Corporation (ORPP AC). The Council will consist of three members who will actively recruit potential nominees, consider the required range of abilities, experience, and skills, assess potential nominees against these criteria and recommend nominees to the government. The Nominating Council is comprised of David Dodge, Claude Lamoureux and Gail Cook-Bennett. Each member brings a wealth of experience that will benefit the establishment of an appropriate and effective initial ORPP AC Board. David Dodge will chair the Nominating Council. He is the former Governor of the Bank of Canada and former Federal Deputy Minister of Finance. He received his bachelor's degree (honours) in economics from Queen's University and his PhD in economics from Princeton (1972). He was made an Officer of the Order of Canada in 2007. Claude Lamoureux was the President and CEO of the Ontario Teachers' Pension Plan from 1990 to 2007. He co-founded the Canadian Coalition for Good Governance and is a fellow of the Canadian Institute of Actuaries and the Institute of Corporate Directors. He received BA degrees from the University of Montreal and Laval University, B. Com. (Actuarial Science) from Laval University and honourary doctorates from Glendon College (York University) and HEC (Université de Montréal). He was appointed to the Order of Canada in 2008 and the Order of Ontario in 2012. Gail Cook-Bennett was the first Chair of the Board of CPP Investment Board from 1998 to 2008 and is currently the Board Chair of the Institute of Corporate Directors. She is a Member of the Order of Canada, received Doctor of Laws degrees (honoris causa) from Carleton University and York University, earned a PhD in Economics from the University of Michigan in Ann Arbor, and was honoured as a Fellow of the Institute of Corporate Directors in 2000. This document was published on August 11, 2015 and is provided for archival and research purposes.